Europe has failed to design institutions robust enough to weather difficult times, as the sovereign debt and refugee crises prove. This column introduces CEPR’s new Monitoring the Eurozone report, Reinforcing the Eurozone and Protecting an Open Society, which argues that coordinated actions are urgently needed. The institutional changes proposed by the authors are politically feasible and would help restore prosperity to the Eurozone. Editors' note: This column was first posted on 4 May 2016 when the draft report was posted. It is being reposted to alert Vox readers that the final version is now available to download (free) here. The sovereign debt and the refugee crises prove that Europe has failed to design institutions robust enough to weather difficult times. The stakes are high: when economic shocks and political crises coincide, the risk of disintegration rises to alarming levels. Coordinated actions are needed, but these are difficult to implement because of the political climate. In short, we may be contemplating the end of Europe as we know it. Our goal in the 2nd Monitoring the Eurozone report, Reinforcing the Eurozone and Protecting an Open Society, is to propose institutional changes that can help to restore growth and prosperity while being politically feasible (Corsetti et al 2016). Unlike the Five Presidents Report (EU 2015) and other recent proposals, which suggest progressive steps aimed at achieving a closer economic, financial, and political union in the medium/long term, we propose a limited set of measures which can be implemented now without requiring a deepening in political or economic integration for which there is little appetite today. This, of course, does not mean that we do not consider a more ambitious plan desirable. Rather, our approach is motivated by a sense of urgency and by our assessment that major changes towards rapid integration would require a long time, and perhaps too long to make the Eurozone secure now. Our central idea, which we started to develop in the first report in the Monitoring the Eurozone series, Dealing with Debt: a New Start for the Eurozone (Corsetti et al. 2015), is that a sovereign debt restructuring mechanism for the Eurozone is a major missing element of its fiscal architecture. In the long run, we think that a fiscal and financial architecture that enforces discipline less by rules – no matter how flexible – and more by market mechanisms would be more robust and more credible. To make this objective realistic without major costs, in the short run, the countries of the Eurozone need a ‘deal’ to redistribute the burden of legacy debt over time and to a minimal extent across-countries. Although we consider such redistribution to be a condition for financial stability and appropriate macroeconomic adjustment, the proposed ‘deal’ does not require debt mutualisation or a joint debt guarantee. As the home bias in bank sovereign bank portfolio is still an important issue, we propose a new financial and regulatory framework to deal with it. Importantly, it is consistent with our fiscal framework, which makes sure incentives are aligned and market discipline is more easily enforced. These proposals are developed in detail in the 2nd Monitoring the Eurozone report (Corsetti et al. 2016). In the absence of a credible and effective debt restructuring regime, official lenders to countries with excessive debt tend to procrastinate and provide additional lending, despite serious solvency concerns. In addition, private-sector investors know that they will be paid, at least in part, by taxpayers. In response, countries in financial distress tend to borrow excessively from other member states and the private sector. The problems are further amplified in a monetary union for at least two reasons. First, countries may not be able to devalue the currency or implement an accommodative monetary policy to reduce the value of their debt. Second, because of close trade linkages between countries and redenomination risk, shocks to a single member state can quickly spread to other countries in the monetary union. A sovereign debt restructuring regime is also a necessary complement to the eurozone’s crisis-lending facility, the European Stability Mechanism (ESM). The main principle of crisis lending is not to lend into insolvency. The ESM should therefore only lend to countries that are conditionally solvent, meaning that they are able to pay back their debts provided they undergo a programme of fiscal adjustment and structural reforms. When countries are insolvent, debt restructuring is needed. Our debt restructuring proposal contains two parts to restore the proper ex ante incentives to private lenders and to avoid the ex post procrastination and hold-out problems of minority creditors. The gross financial needs are less than 20% of GDP. 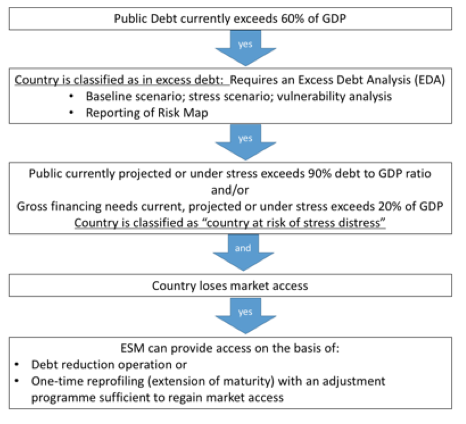 In case either of these thresholds is broken, there are only two options: (i) a one-time reprofiling, or (ii) a debt reduction operation.1 The amended ESM lending framework can then be seen in Figure 1. The second part of the proposal addresses the ‘hold-out problem’ of small minority creditors. We propose a statutory solution by inserting a clause in the ESM treaty that would extend immunity from judicial process to sovereigns that negotiated a debt restructuring with a (super-)majority of creditors in the context of an ESM programme. The bank-sovereign loop is an important factor contributing to the instability in the Eurozone. Banks hold large portfolios of sovereign debt, and in particular of their own country. Hence, when sovereigns are in distress, so are the banks. In addition, home bias tends to increase during periods of financial stress. High legacy debt and the bank-sovereign loop put a heavy burden on the ECB in a world with volatile markets and unstable risk premia, since it has to monitor the market conditions continuously and intervene occasionally to safeguard the monetary transmission channel. There are several possible reasons why the portfolios of banks are tilted towards bonds of their own sovereign. The home bias of banks in the periphery may in part be due to the fact that sovereign risk weights are zero or that banks can implement a highly profitable ‘carry trade’ by borrowing at the ECB’s low rates and investing in high-yielding sovereign bonds. However, these explanations suggest that a country should invest in the riskiest sovereign debt available, not necessarily the bonds of their own sovereign. Other explanations may be moral suasion by domestic governments, banks betting on preferential treatment in case of a sovereign default, banks realising that their own fate is highly connected to the future of the sovereign, or home bias may be a response to the risk of disintegration of the euro, where banks try to mitigate the currency mismatch risk in case of redenomination. Risk diversification, where the risk weights of a basket of euro-area bonds carry a zero risk weight. We consider the first solution to be least attractive. Banks would have an incentive to invest in the riskiest sovereign, it would not promote the creation of a safe asset in the Eurozone, and the transition would involve large portfolio rebalancing effects and immediate price effects, as asset prices are forward looking. Instead, we propose to combine the second and third solutions in a way that is consistent with our fiscal framework. We proceed in two steps. First, we propose that the ESM/ECB assign risk weights to each Eurozone country’s sovereign debt based on the marginal bands of the SDRR, which are then aggregated to an average risk weight for each country. The riskiness of the bond is therefore consistent with our steady-state fiscal framework. Second, we propose that the ESM/ECB introduce a registration scheme for the private sector to create sovereign-debt-backed CDOs. Under the scheme, CDOs backed by qualifying portfolios of sovereign bonds could be divided into three tranches with different risk weights. To qualify, the underlying portfolio would have to contain sovereign bonds from the different Eurozone sovereigns in proportion to their GDP (or ECB capital keys), within some explicit tolerance bands. The risk weights of the tranches are chosen so that, in aggregate, these tranches attract the same RWAs as if the bonds were held directly by a bank. At the same time, the rule would allow one tranche to attract zero RWAs while the others attract more. In addition, the registration scheme would require that the tranches be given differential seniority, so that the tranche attracting zero RWAs was also senior to the other tranches. These measures combined would encourage the creation of a set of securities (“Series A” of the registered CDOs) which would be able to play the role of a Eurozone safe asset. Our hybrid approach offers several advantages. First, it ensures that there is some risk absorption capacity for sovereigns while still allowing the market to enforce discipline. Second, it motivates diversification of sovereign risk across countries. Third, it encourages the creation of a large safe asset market (CDO series A) carrying zero risk weight, which is valuable for financial institutions and for the ECB’s conduct of monetary policy. Given the large balance sheet and the portfolio of the ECB and national central banks, the transition can be managed without any price effects. In particular, the ECB can organise swaps of national debt against GDP-weighted basket of bonds between the ECB and the banking sector. For example, an Italian bank could swap Italian sovereign bonds against an equivalent amount of diversified sovereign bonds (at the market price) held on the balance sheet of the ECB. Given the current, expanded balance sheet of the ECB, this swap operation could absorb a large amount of necessary portfolio rebalancing without any price effect and without changing the portfolio of the ECB. The risk profile of the ECB would not change: the central bank receives inflows from Spain, Germany, Italy, and repackages it to return the portfolio. Given their large inventory, they can swap it right away. So, in effect, the ECB would be the intermediary of the swap of debt between national debts and the diversified bonds. The creation of a diversified Eurozone safe asset can also be used in the regulation of other financial institutions, such as insurance companies and pension funds, whose portfolios are similarly biased towards bonds of their own sovereign. This would limit the correlation between sovereign distress risk and the long-term retirement savings and the stability of the insurance sector. We cannot implement our proposals to remodel the existing fiscal and regulatory institutions given the high levels of debt-to-GDP as announcing the proposals could be highly destabilising. We therefore propose a coordinated one-off solution to remove the debt overhang problem in exchange for a permanent change in institutions. Going forward, the SDRR avoids excessively high levels of sovereign debt. We propose a combination of (i) a debt buyback via a stability fund, which is capitalized using taxes (wealth, VAT, carbon taxes, etc.) or seigniorage, and (ii) a swap of sovereign bonds for a combination of debt and equity (GDP-indexed debt). Some options in the menu of our proposals involve limited and temporary risk sharing across countries, while the traditional moral hazard concerns are mitigated given the transition to the new SDRR in which the ‘no-bailout clause’ can be credibly enforced. The new stability fund, which is backed by the sovereigns of the Eurozone, should buy back debt so that the debt-to-GDP ratio drops below 90% and retire it. The stability fund issues bond in the same maturity bracket, and the fund is collateralised with future tax revenues for an extended period of, say, 50 years. Hence, countries swap national debts, which are subject to default risk, for a nominally safe asset issued by the stability fund, which means that this is not a neutral fiscal operation or a simple accounting gimmick. The liquidity of the fund is guaranteed by the ECB. We provide a simple calibration in which we assume that each country commits 0.5% of GDP each year to the stability fund for 50 years. Assuming a conservative real rate of 2% and an average real growth rate of 1%, the net present value amounts to €2 trillion. We furthermore assume that €1 trillion of seigniorage of the ECB is committed. 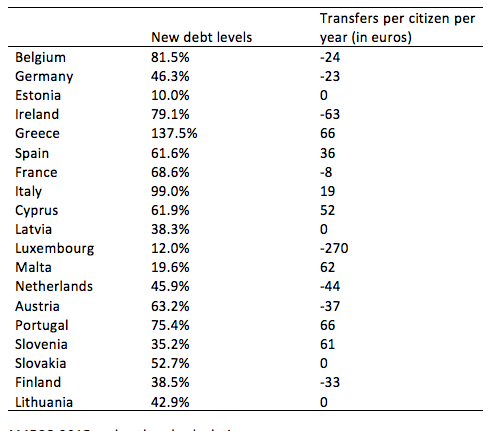 Without any redistribution, we can reduce the debt levels significantly (see Table 1). Source: AMECO 2015 and authors’ calculations. However, Italy, Portugal, and Greece are still above 90%, although we consider Greece to be a special case with which we should deal separately. Alternatively, we can allow for a small amount of temporary risk sharing. For instance, the stability fund can redistribute the resources in an equal share to each citizen. Using the same assumptions as before, each citizen would receive a dividend of about €9,000. The first column of Table 2 provides the new debt levels, and the last column measures the transfers per year per citizen, or the degree of risk sharing. In these calculations, we omit the Baltic states and Slovakia, as this risk sharing arrangement would lead to negative debt level in their case. 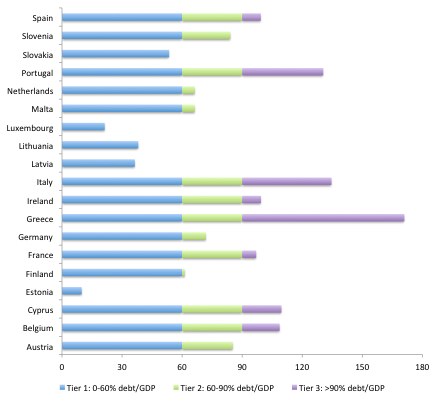 For all countries, with the exception of Greece and Italy, the debt-to-GDP level would be below 90%. For Italy other fiscal revenues should be added. One possibility is to use or increase the wealth tax for example on second homes, which could be levied during the same 50-year period or any period deemed appropriate. Another possibility is to use debt equity swaps (along the lines of Corsetti et al. 2015). The advantages of this proposal is that is can be done quickly, it does not threaten stability as asset values are boosted, and the windfall gain for existing holders of sovereign debt with high spreads is limited given the compression in spreads throughout the Eurozone following the quantitative easing programme. To make sure future tax revenues are committed credibly, one could use Eurozone resources (seigniorage). However, it does also require additional tax revenues, but these can be generated over a long period. This proposal, beside dealing with financial stability issues still haunting the Eurozone, would lead to a better mix of fiscal and monetary policy since it would relieve the ECB of the excessive responsibility it has now with regards to macroeconomic stabilisation and would free spending capacity today. A key point of the proposal, which is discussed in more details in our report, is that it should be thought of as a comprehensive package.2 If there were insufficient political will to implement all of them, one should be careful about picking only parts of them. For example, only implementing the ideas relative to the fiscal framework and the SDRR, without managing carefully how one gets there, would be risky. In a nutshell, we are trying to navigate a treacherous transition to end up on the right shore. Corsetti G., Feld L., Lane P. , Reichlin L., Rey H., Vayanos D. , Weder di Mauro, B. 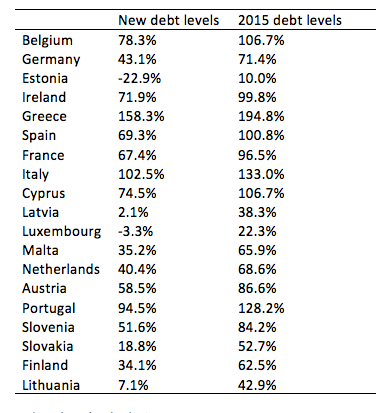 (2015), A New Start for the Eurozone: Dealing with Debt, Monitoring the Eurozone 1, CEPR Press. Corsetti G., L. Feld , R. Koijen, L. Reichlin, R. Reis, H. Rey and B. Weder di Mauro (2016), Reinforcing the Eurozone and Protecting an Open Society, Monitoring the Eurozone 2, CEPR Press. EU (2016), The Five Presidents’ Report: Completing Europe’s Monetary and Economic Union. For countries with concessionary lending, the net present value of debt is computed using a fixed discount rate, instead of the market value of debt, consistent with the IMF and World Bank debt sustainability framework. Using the net present value avoids that the debt to GDP ratio mechanically falls for countries in distress as spreads widen. See https://www.imf.org/external/np/exr/facts/jdsf.htm. Monitoring the Eurozone 2 also contains a chapter on the refugee crisis (Chapter 4), which will be summarised in a separate Vox column.